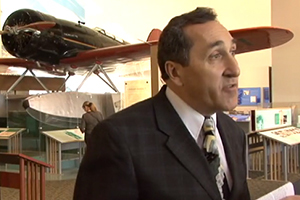 Ask an Expert: Cal Rodgers and the "Vin Fiz"
Dr. Peter Jakab, associate director for collections and curatorial affairs at the National Air and Space Museum, discusses the Cal Rodgers and the "Vin Fiz." This informal gallery talk was recorded on October 13, 2010 as part of the National Air and Space Museum's "Ask an Expert" lecture series. In the summer of 1911, Calbraith Perry Rodgers Learned to fly at the Wright Brothers’ aviation school in Dayton, Ohio. Immediately thereafter he participated in an international air meet at Chicago, where he won a prize for flying the longest during the nine-day event. “Cal” decided to take on the challenge offered by newspaper magnate William Randolph Hurst to fly from coast to coast in 30 days or less. Rodgers chose to fly a modified version of the Wright Model “B”, the “EX” (for experimental), a smaller single seat version with a 15-gallon fuel tank for a 3 ½ hours flying time and a top speed around 60 mph. As a sponsor, the Armour Company of Chicago would use Rodgers as a flying billboard to promote a subsidiary companies new grape drink; “Vin Fiz” and in return, Rodgers would receive $5 a mile. There was one other very important characteristic about Rodgers; he was deaf. Scarlet fever had left Rodgers without the ability to hear since childhood. On September 11, 1911 Rodgers took off from Sheepshead Bay, NY. After surviving 19 crashes (5 of which were quite serious), Rodgers landed the Vin Fiz in Pasadena on November 5th . The total flying time for the 4,321-mile trip was 82 hours, 2 (4?) minutes at an average speed of 52 mph. Cal wanted to complete his journey to the Pacific Ocean, and on December 12 flew to Long Beach, where he at last dipped Vin Fiz’ skids into the surf. He did not make the time requirement in order to receive the prize, but had decided to press on and become the person first to fly from coast to coast. By the time he reached the west coast, little remained of the original plane that had started out on the east coast. Only two wing struts and the vertical rudder remained from the original craft. The Vin Fiz had been patched up with two engines, twenty skids, eighteen wing panels and various other parts. Sadly, Rodgers was killed on April 3, 1912 when he flew into a flock of seagulls off of Long Beach CA. 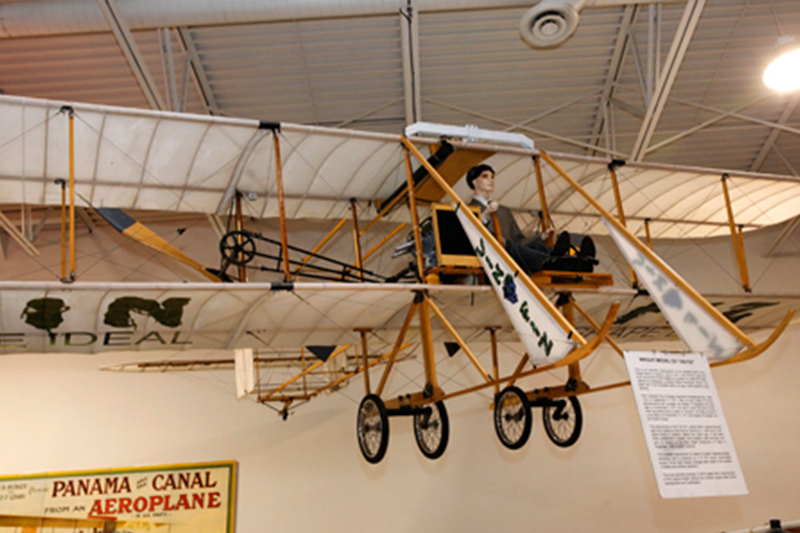 The Collings Foundation “Vin Fiz” replica was built using the same processes by which the original Wright flyers were built. It is on permanant static display in Stow, MA at the Collings Foundation headquarters.